Belgium counts about 3000 castles on a total land surface of a little more than 30.000 square kilometers, or on average 1 castle for every 10 square kilometers. Most of them you will never see as they are hidden deep inside their own fenced forests or otherwise inaccessible. Sometimes when driving on the motorway you can discover a castle in a beautiful landscape. However, do not leave at the next exit, because you will probably not be able to find out how to get there, if at all possible. 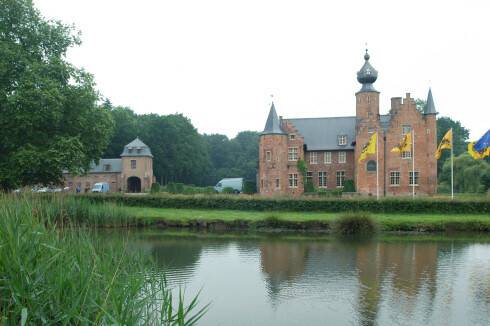 In Flanders a "Castle" will be indicated as "Kasteel". In Wallonia you will read "ChÃ¢teau". From a hotel in Bruxelles the whole of Belgium is within reach for a day trip. Find Brussels Hotels on this professional website - www.hoteltravel.com. These coordinates will help you to find the most beautiful castles in Belgium. Unless you want absolutely get to a point "the fastest way", we advise to choose "the shortest way" or "scenic routes" if your navigator offers this choice. This way finding a castle is even more enjoyable, because the route towards it will already be a pleasure. 1 Dukes of Brabant castle in Turnhout. Dates from the 12th century and was restored in the 16th century. Now it is a court of justice. Interior can be visited after written demand at the court. 2 Renesse castle in Malle. From the 15th century and now municipality property. The castle lies in a park of 27 ha (67 acres). The park is freely accessible and the castle is open on Sundays from 2 PM - 6 PM. 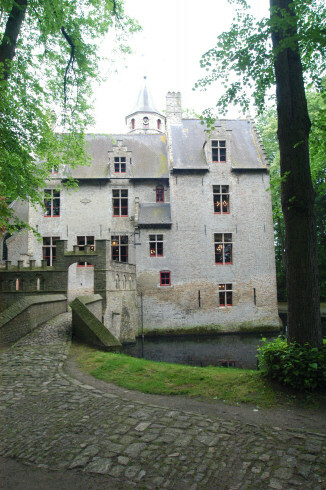 3 Veltwijck castle in Ekeren. A splendid water castle from the 16th century with a nice garden. Now it serves as the town hall for the town of Ekeren. 4 's-Gravenwezel castle in Schilde. Founded in 1200 and renovated in the 14th and 18th century. Lies in a 21 ha (58 acres) big park. The castle now houses an antique shop, but the rest of the interior can not be visited. 5 Ter Leyen castle in Assenede. Very nice water castle from the 17th century, situated behind the church of Boekhoute. Interior can not be visited. 6 Schoten castle in Schoten. Also a 17th century water castle. Now serves as cultural center. Open on weekdays from 9 AM - Noon and from 1.30 PM - 4 PM. 7 Borrekens castle in Vorselaar. Castle from the 13th century, but entirely renovated in the 17th century. The interior can not be visited. 8 Vrieselhof provincial domain in Ranst. A 75 ha(185 acres) big park with a castle, a pond, and 2 brooks. Open to the public from sunrise to sunset. 9 Rivierenhof provincial domain in Antwerp. This is the biggest park in Antwerp with a castle, an open-air theatre, an art gallery, mini golf, walking routes, ponds, playgrounds and a roze garden. Open all year from 6 AM - 10.30 PM. 10 Cortewalle castle in Beveren. Castle from the 15th century in a 9 ha (22 acres) big park. Municipality property and part of a cultural center. In the loft there is a Lace museum and a regional geography and history museum (open from end of April - end of September on Sundays from 2 PM - 5 PM. The park is freely accessible and in the castle there are often exibitions, receptions, meetings, concerts, etc. 11 Male castle in Bruges. (Note that "Male" is not the English word "male"). 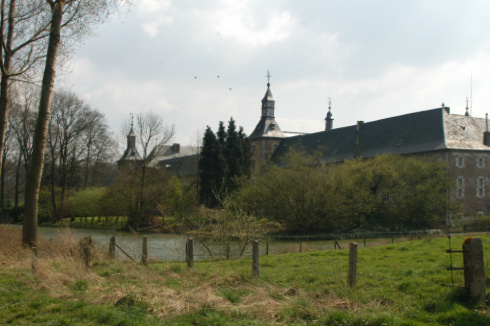 Once the castle of the Counts of Flanders, now it is an abbey of the sisters of the Holy Sepulcher. The church and the hall can be visited daily from 9 AM - 11.30 Am and from 2.30 PM - 5 PM. On Sundays from 10.30 AM - 11.30 AM and from 2.30 PM - 5 PM. 12 Hof ter Saksen castle in Beveren. This 18th century castle has recently been renovated. In the park you can visit an arboretum, a natural garden, a green house and an ice cellar. Open from Aril - October, daily from 10 AM - 6 PM. The garden cefeteria is open in the weekends from 2 PM - 6 PM. 13 Ryckevelde castle in Bruges. This recent 20th century castle lies in a 85 ha (233 acres) big forest. Part of it is always open for the public, the rest also during weekends. Now property of the city of Bruges. 14 Tillegembos provincial domain in Bruges. A 113 ha (280 acres) big nature domain with a castle, walking routes, sunbathing lawns, play grounds, and a rural tavern and a horse-mill. Domain to be visited from sunrise till sunset all year. The interior of the castle can not be visited. 15 Sorghvliedt castle in Antwerp. The domain and the 15th century castle are the property of the city of Antwerp and serve as district house for the district of Hoboken. 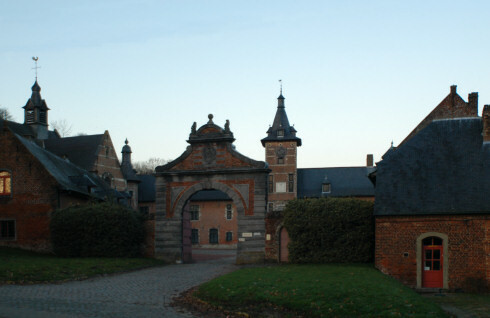 16 Caloen castle in Zedelgem. A neo-ghotic castle from 1860. In the park there is a maze. The castle can be visited from April - October, every day, except on Mondays and Fridays from 10 AM - Noon and from 2 PM - 6 PM. 17 Wissekerke castle in Kruibeke. Castle from the 15th century with lake, park and a suspension bridge. Municipal property. Guided visits after arrangement. 18 Hemiksemhof castle in Hemiksem. Castle and park are protected as monument and urban conservation area. The castle interior can not be visited. 19 Cleydael castle in Aartselaar. 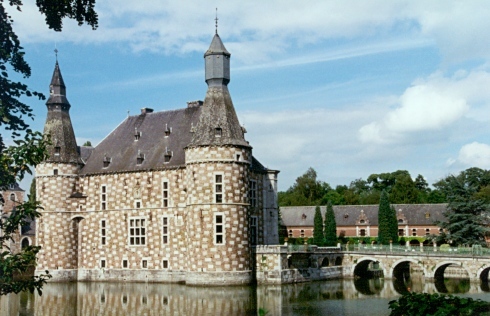 Castle from the 14th century is located on a islet in the Struisbeek and houses a hotel-restaurant and a golf club. Only to be visited by clients of the hotel-restaurant and members of the golf club. 20 Solhof castle in Aartselaar. The coach-house of this castle houses a restaurant and the main building is now a hotel. 21 Gestelhof castle in Berlaar. This castle from the 16th century lies in a splendid park and is at three sides enclosed by water. The castle interior can not be visited. 22 Rameyenhof in Berlaar. This is a 13th - 14th century water castle with castle farmstead. The interior can not be visited. 23 Herlaar castle in Herenthout. Castle from the 13th century with two towers, a drawbridge and a park. The interior can not be visited. 24 Sombeke castle in Waasmunster. A 15th century castle, beautifully restored in the 1980 's. The interior can not be visited. 25 Blauwendael castle in Waasmunster. Small 17th century castle that today houses a regional geography and history museum and the multi-media resource center of an environmental association. The museum is open every second Sunday of a month from 10 AM - Noon and from 2 PM - 5 PM. The multi-media center every second Sunday of a month from 10 AM - Noon. 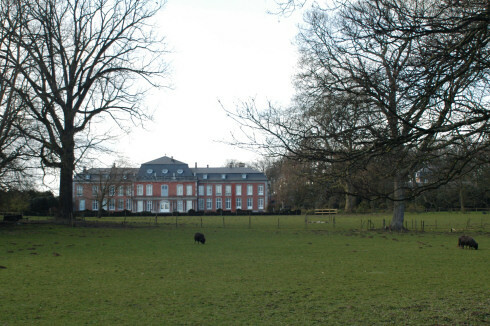 26 Provincial Domain d'Ursel in Bornem. A 18th century nobility summer residence in a 28 ha (77 acres) big park domain with French garden and forests. Actual under renovation. The park is open from sunrise till sunset all year. 27 Marnix van Sint-Aldegonde castle in Bornem. 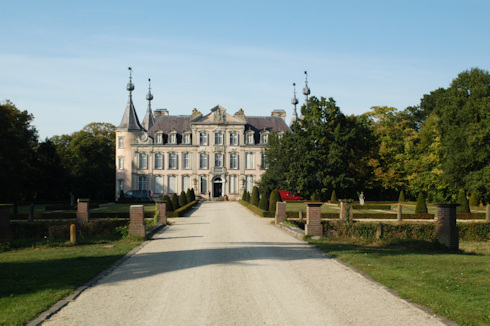 This private castle, renovated in 1888, is situated in a splendid landscape along the Old Schelde. The castle houses an exhibition about its history, as well as a lace exhibition and a coaches collection. 28 Merode castle in Westerlo. Early 14th century castle with splendid park. Can only be visited during the once a year "castle festivities" in the first weekend of July. 29 d'Aertrycke castle in Torhout. 18th century castle with park, lake and boathouse. The former coach house is transformed to hotel rooms and a meeting room. The park is freely accessible from sunrise till sunset. 30 Schouwbroek castle in Vinderhoute. Impressive 16th century castle in a 30 ha ( 82 acres) big, splendid park with some very old trees. The castle can not be visited. 31 Wijnendale castle in Torhout. Founded in the 11th century, transformed in the 13th and totally rebuilt in the 19th century. Inside the castle one can visit a museum about the history of the castle. Open from May 15 - September 15 on Tuesdays, Wednesdays and Sundays from 2 PM - 6 PM. 32 Ter Motten castle in Dilsen-Stokkem. Built in 1725, it is now the town hall. Open all workdays from 9 AM - Noon and from 2 PM - 4 PM. 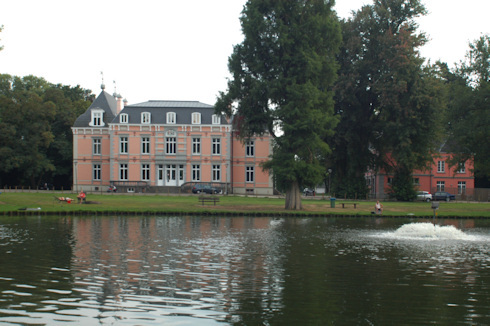 33 Ravenhof castle in Torhout. This very old castle houses the Tourist Office and a museum about pottery from Torhout. Open all workdays from 9 AM - Noon and from 2 PM - 5 PM. From May 15 - September 15 also during the weekends. 34 Gravensteen castle in Ghent. Big stronghold from the 12th century. Till the first half of the 15th century the Counts of Flanders lived here. The courtroom, the hall for parties, the rooms of the Count and Countess and the underground prison can all be visited. Open dailly from 9 AM - 5 PM. From April - September till 6 PM. 35 Meylandt castle in Heusden-Zolder. Precious building from the late 14th century in a nice park with splendid ponds. Actually it houses the Academy of Fine Arts. The park can freely be visited. 36 Poeke castle in Aalter. Castle is in the 17th - 18th century restored in Frech style. Now municipal property, housing an information center and events hall. The castle is open during cultural events. The park is freely accessible. 37 Laarne castle in Laarne. Old feudal castle from the 14th century. Altered in the 16th and 17th century. Nowadays a museum with precious collections of European Silver and 16th - 18th century furniture and wall tapestries. Open from Easter - October, every Sunday from 2 PM - 5.30 PM. In July and August every day of the week, except on Mondays and Fridays. 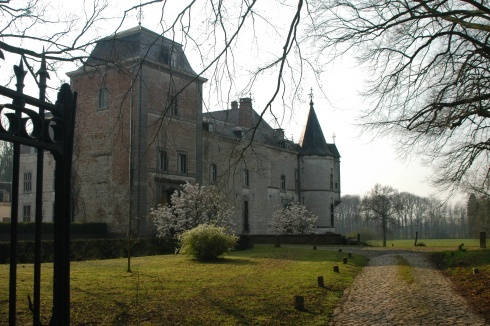 38 Beauvoorde castle in Veurne. Water castle from the 17th century. Now property of the Belgian State and home to the Royal Academy for Dutch Language- and Literature. Castle can be visited from April 1 - October 31 from Thursday - Sunday from 2 PM - 5.30 PM. In July and August also on Tuesdays and Wednesdays. From November 1 - March 31 only on Sundays. The park can be visited every day from 10 AM - 6 PM, closed on Mondays. 39 Diepensteyn castle in Londerzeel. Splendid renaissance castle, entirely renovated by brewery Palm. The castle, park with several ponds, and the stables can only be visited during a guided tour of the brewery. 40 Ooidonk castle in Deinze. Beautiful 13th century castle that was destroyed and rebuilt in the 16th century, situated on a 300 ha (740 acres). In the interior very interesting old furniture, wall tapestries and paintings. Castle and park are open to the public. Castle open from Easter - September 15 on Sundays and public holidays from 2 PM - 5.30 PM. In July and August also on Saturdays. The park is open all year. 41 de Blankaart castle and Nature Reserve in Diksmuide. A 250 ha ( 685 acres) big Nature Reserve with a castle and its 50 ha (137 acres) park, a 50 ha (137 acres) big pond, 20 ha ( 55 acres) big reed swamp, and 180 ha (493 acres) of hay lands and meadows. For those who love walking in a splendid unspoiled nature, this domain is a real must. 42 Olmenhof-Hariaz domain in Herk-de-Stad. A big park with castle, play ground, mini golf, fishing ponds, and walking routes. Park open all year from sunrise till sunset. 43 Moorsel water castle in Aalst. A 16th century water castle in a splendid park. The interior of the castle can not be visited. 44 Horst castle in Holsbeek. Another beautiful water castle from the 15th century. 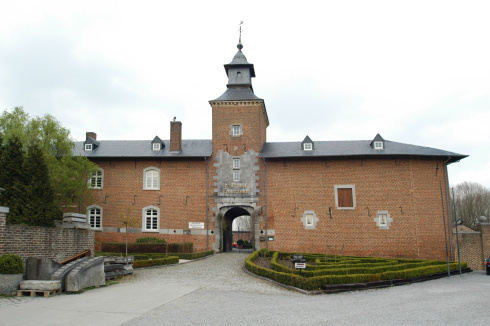 Now administered by the Foundation for Flemish inheritance.The castle can be visited every Sunday from 2 PM - 6 PM. From April 1 - October 31 also on public holidays. 45 Rumbeke castle in Roeselare. One of the oldest Renaissance castles of Belgium. Now owned by the professional League of Coach- and Bus enterprises. In the castle there are conference rooms and a concert hall. 46 Sterrebos Provincial Domain in Roeselare. A 22 ha (54 acres) big forest domain with a very nice castle. From the summerhouse on the domain there start 10 alleys in the form of one big start. Hence the name of the domain: Star Forest. The park can be visited all year from sunrise till sunset. 47 Ham castle in Steenokkerzeel. A 15th century castle enclosed with a moat. Property of the Flemish Community, who uses it as conference center. The interior of the castle can not be visited. 48 Ingelmunster castle in Ingelmunster. 11th century castle with park. In 2001 for the most part destroyed by fire. Only the the basement was spared and contains now a cafeteria and a beer cellar. Restoration works for the castle are on going. The taverne can be visited from Easter till September from Saturday - Thursday from 2 PM. From October - Easter only during weekends and public holidays. 49 Blauwhuis castle in Izegem. This castle with parts from the early 19th century lies in a 11 ha (30 acres) big park and is now arranged as a restaurant and hall for parties. 50 Wemmel castle in Wemmel. 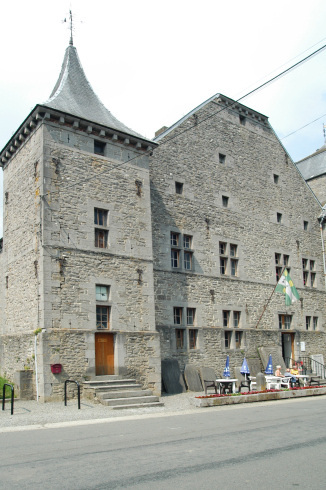 The Town Hall of Wemmel is now housed in this 17th century castle. Open on workdays from 8.30 AM - Noon and from 1 PM- 5 PM. 51 Hernieuwenburg castle in Wielsbeke. 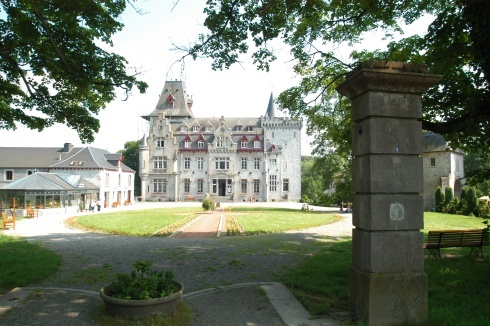 In the 19th century restored castle in a nice park with sport- and recreation facilities. Now serves as town hall and is open on workdays from 8 AM - Noon and from 1 PM - 5 PM. 52 Kruishoutem castle in Kruishoutem. This castle from the 17th century is remarkably well preserved and lies in a big park. The interior can not be visited. 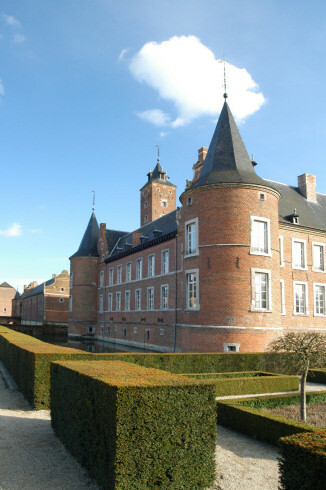 53 Leeuwergem castle in Zottegem. 18th century castle in a 15 ha (41 acres) big park with lakes and canals. Very special is the "Foliage Theatre", formed by hornbeam trees with place for 1.200 visitors. The interior of the castle can only be visited by groups by appointment. 54 Wannegem-Lede castle in Kruishoutem. Classicist castle from 1786, after the example of the Petit Trianon of Versaille. The interior of the castle can not be visited, but its surroundings lend themselves very well for some nice walking. 55 Groot-Bijgaarden castle in Dilbeek. A 17th century castle enclosed by a moat. Part of the castle is the donjon from the 14th century. Several halls from the castle can be hired for parties. Open from Monday - Friday from 9 AM - 6 PM or after arrangement. 56 Arenberg castle in Leuven. Originated from the 16th century, this castle was thoroughly renovated in the 19th century. Now property of the University of Leuven, which houses the Applied Mathematic Sciences Faculty in it. The interior can only be visited by group by appointment. 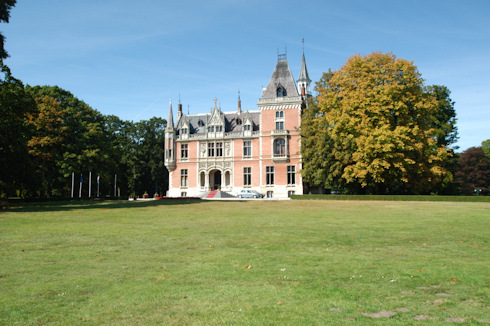 57 Breivelde castle domain in Zottegem. 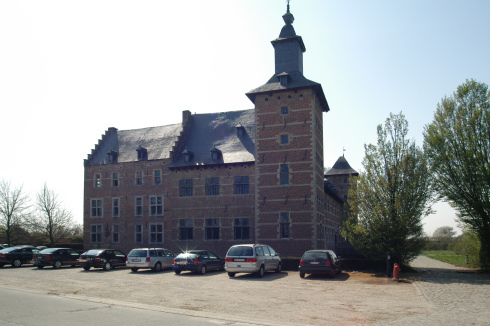 Castle, owned by the town of Zottegem. 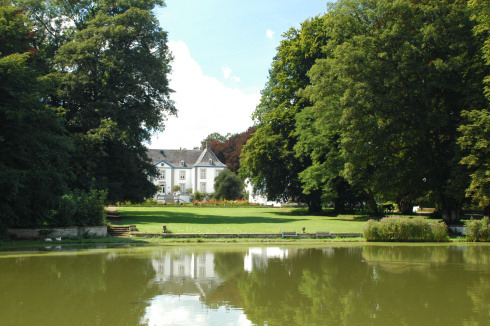 Situated in a 14 ha (38 acres) big park with 14 ponds in terrace form. 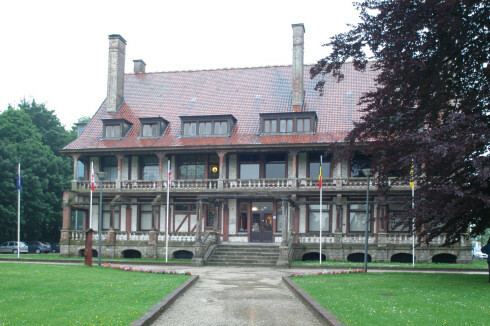 58 Zonnebeke castle domain in Zonnebeke. 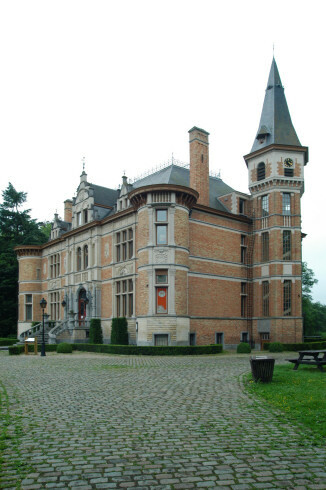 This castle, property of the town of Zonnebeke, is situated in a 7 ha (19 acres) big park, which is open all year. The castle is used for social and cultural events and houses since 2004 the Memorial Museum Passchendaele 1917 about WW I in this region. 59 Alden Biesen castle in Bilzen. This huge complex was built by the German Order of Knighthood. Now it is a cultural center of the Flemish Government. It serves as conference center and is a culture-tourist attraction. 60 't Rood castle in Kortessem. Water castle from the Middle Ages. Nowadays a tavern-restaurant. Open from Wednesday - Sunday. 61 Schalkhoven water castle in Hoeselt. This water castle is situated in a splendid park with very rare trees. Castle and park are listed as protected monuments. The interior can not be visited. 62 Viron castle in Dilbeek. This huge castle from 1863 was built on the principle of a year calendar: there are 12 towers, 52 front rooms, 7 rooms with stairs, and 365 windows. Nowadays the town hall to be visited on workdays from 9 AM - Noon and on Thursdays also from 6 PM - 8 PM. 63 La Motte castle in Dilbeek. A walled classicist castle from 1773. Now property of the Dilbeek town, who uses it as poly valent cultural center. Halls can be hired for meetings, seminaries, etc. Open from Monday - Friday from 9 AM - Noon and from 1 PM - 5 PM. Closed in July. 64 Kwabeek castle in Boutersem. This 18th century castle with park and farm serves now as town hall. Open on workdays from 9 AM - Noon. The park is open all year from sunrise - sunset. 65 Rullingen castle in Borgloon. 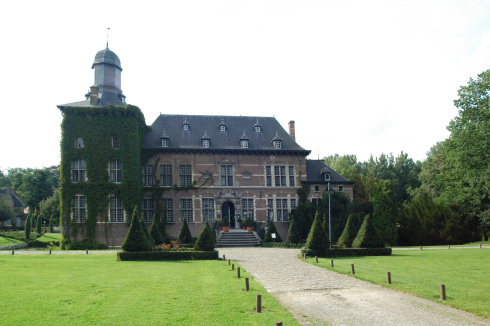 This beatiful castle from 1640 lies in an even splendid park of 12 ha (33 acres) and is property of the province of Limburg. The castle serves now as a hotel-restaurant and can be visited as such. The park can be visited all year for free. 66 Winecastle Genoelselderen in Riemst. Magnificent castle from 1750, now surrounded by the biggest vineyards in Belgium, a roze garden and an experimental garden with 20 different grapes. Four excellent wines are produced in the castle. Castle can be visited by groups after arrangement. The park is open all year. 67 Rijkel castle in Borgloon. Originating from the 16th century, but totally rebuilt in the 17th and 18th century. surrounded with 9 ha (25 acres) of standard (high) fruit trees. 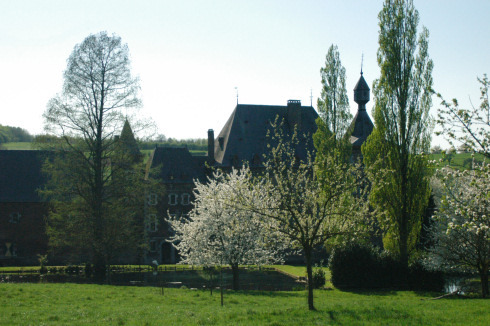 The castle now houses the Service of the Arts Patrimony of the province of Limburg. The castle is partially accessible to the public, the park in its entirety. 68 Betho castle in Tongeren. A 17th century castle that can not be visited, but there are great paths for relaxed walks around the castle. 69 de la Motte castle in Sint-Truiden. Old castle from the 14th century with a 6.5 ha (18 acres) park and some herb gardens. Now it houses a restaurant with outside terraces, a brewery and rooms for parties. Restaurant and brewery are open from Wednesday - Sunday from 11 AM. 70 Gaasbeek castle in Lennik. Splendid 13th century defence castle in a 4.2 ha (11.5 acres) museum garden. The garden can only be visited by groups of 10 persons minimum. The castle contains about thousand precious pieces of art and can be visited from April 1 - October 31 from Tuesday - Sunday from 10 AM - 6 PM. 71 Meldert castle in Meldert. 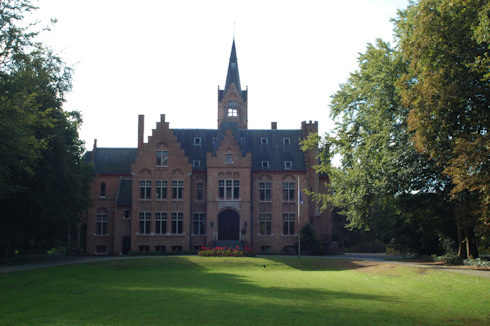 The students of the Sint-Jans College in Meldert are the lucky one, who follow their courses in this 19th century castle. But if you are not a student there, you can still admire the outside of the castle from the play ground. 72 Hex castle in Heers. Splendid castle from the 18th century. Several formal- and landscape gardens, as well as a botanic rose garden and a big kitchen garden complete the scenery. The gardens can only be visited by groups after written arrangement. 73 De Warande castle in Heuvelland. Neo-baroque castle from 1925 in a 17 ha (57 acres) big park with ponds and footpaths for nice walkings. Used as administrative center for the Heuvelland municipality . Open on workdays from 9 AM - Noon and from 1.30 PM - 5.30 PM. 74 Beersel castle in Beersel. Walled castle from the early 15th century with two living towers from the 17th century, enclosed with a moat. Open from March 1 - November 15 from Tuesday - Sunday from 10 AM - Noon and from 2 PM - 6 PM. The rest of the year only in the weekends and during public holidays. 75 Cammanderie in Voeren. Walled commandery from the 17th century from the German order of Knighthood of Alden Biesen. The commandery can not be visited, only the fishing ponds during the weekends. 76 Domain Solvay in La Hulpe. The official name of this castle from 1842 is "Kasteel van Terhulpen". On the 220 ha (600 acres) big domain one can find a French garden, lots of garden sculptures, afforest hills, ponds, lawns, kilometers long walking routes, and more. The castle can only be visited during manifestations. The park all year. In the summer from 8 AM - 9 PM, in the winter from 8 AM - 6 PM. 77 Huizingen Provincial Domain and castle in Beersel. Impressive castle in a 90 ha ( 248 acres) big park with open air swimming pool, a pond where you can row, a sunbath lawn, rock garden with many beautiful flowers. Open all year from 9 AM - sunset. 78 Ter Rijst castle domain in Pepingen. This domaim is one of the most attractive ones in Belgium. Around the small neo-classicists castle is situated a 49.5 ha (136 acres) big national park with exceptional trees and old fashioned orchard. The park is open all year from sunrise - sunset. The nature reserve only with guide. 79 Rixensart castle in Rixensart. A pearl of Renaissance architecture, this castle from the 17th century can only be visited by groups after arrangement by the Tourist Office. 80 Burg Raeren in Raeren. Walled castle, founded in the second half of the 14th century. Importantly altered in 1790. Property of the municipality of Raeren, who installed a pottery museum in it. Open from Tuesday - Sunday from 10 AM - 5 PM. 81 Empain castle in Enghien. The new castle only dates from the 20th century, but it is situated in one of the most beautiful gardens of Europe. From the 180 ha ( 493 acres), 120 ha ( 329 acres) is open to the public. Open from Easter - the end of October, daily from 10 AM - 6 PM. Other months from 10 AM - 4 PM, weekends till 5 PM. 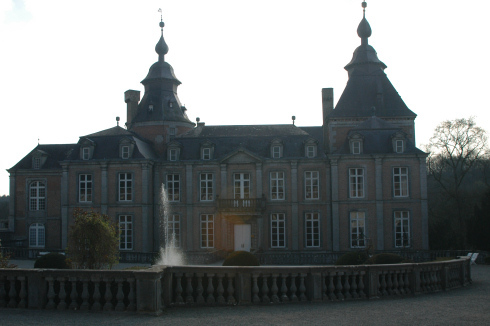 82 WÃ©gimont castle in Soumagne. 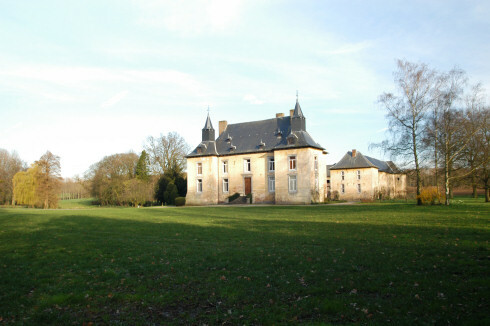 A 22 ha (60 acres) big domain with beautiful castle in Maasland style. On the domain one can find an open-air swimming pool, midget golf, possibilities for fishing, a training circuit, a camping ground, pick nick and barbecue facilities. Lodging and restaurant in the castle possible all year after reservation. The recreation center is open from May - June every day from 10 AM - 7 PM. In July and August till 8 PM. 83 Castle-Fortress in Fallais. With its origins in the 13th century, this mighty and mighty-looking castle was renovated in the 19th century. Open to groups on request. 84 Harlue castle in Bolinne-Harlue. This 17th century castle can not be visited, but when you pass there you can admire the castle, a 18th century church, and a 18th century presbytery, all very close to one another. 85 Val-Saint-Lambert castle in Seraing. You will probably want to visit this castle for the exposition that shows the social, cultural and industrial history of the famous Val-Saint-Lambert crystal. Open from March 1 - September 30 every day from 10 AM - 5 PM. Rest of the year only in the weekends and on public holidays. Closed from December 16 - February 28. 86 Oultremont castle in Warnant-Dreye. This 17th century castle with its farm, chapel, and gardens forms a very remarkable whole in the flat Hesbaye country. Can be visited by groups after reservation. 87 Attre castle in Brugelette. Well preserved 18th century castle in a 17 ha (47 acres) big very special park. The interior of the castle is realy splendid. Park and castle can be visited. Not free. Open in July and August during weekends and public holidays from 1 PM - 6 PM. In April, May, June, September and October from 2 PM - 6 PM. 88 Jehay castle in Amay. 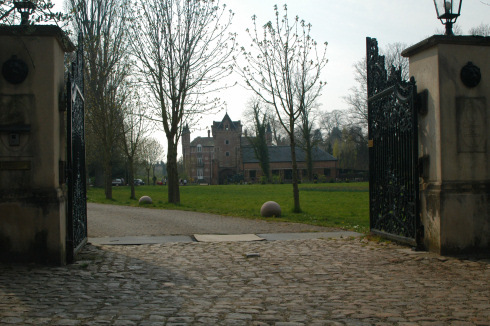 When the last Count van den Steen died in 1999, the castle and domain became the property of the Province of LiÃ¨ge and during several years important restoration works have been undertaken. The castle and gardens are of an extreme beauty. Inside the castle one can admire the very precious collections of Count Guy van den Steen. Castle and gardens are open to the public. In June during the weekends from 11 AM - 6 PM and on Wednesdays from 2 PM - 5 PM. In July and August during the weekends from 11 AM -6 PM and from Tuesday - Friday from 2 PM - 6 PM. In September during the weekends from 11 AM - 6 PM and on Tuesdays and Wednesdays from 2 PM - 5 PM. 89 Louvignies castle in Soignies. A 19th century castle with English-style landscape park. To be visited during the summer months on Sunday afternoons from 2 PM - 6 PM. 90 Ecaussinnes-Lalaing castle in Ecaussinnes. Built from the 11th - the 17th century on a rock that governs the Senette valley. Inside the castle are halls with important furniture and art collections. Open in April, May, June, September and October during the weekends and public holidays from 10 AM - Noon and from 2 PM - 6 PM. In July and August from Saturdays - Thursdays. 91 Miremont castle in FÃ©luy. Castle built in 1853 with a park of 5 ha ( 14 acres). The castle and park can be hired for weddings, receptions, and seminars. 92 Princes de Ligne castle in Antoing. Remarkable walled castle along the Schelde river. Guided visits from the middle of May till the end of September on Sundays and public holidays at 2.30 PM, 3.30 PM and 4 PM. 93 Fernelmont castle in Fernelmont. A 16th - 17th century castle with a 13th century donjon. Surrounded by a big pond and the farm buildings. Open from June - September during the weekends and on public holidays from 2 PM - 5.30 PM. 94 Beloeil castle in Beloeil. Domain and 14th century castle with splendid French and English gardens for a total of 120 ha (330 acres). Open from Easter till end of May during the weekends and public holidays from 1 PM - 6 PM. From June till the end of September every day, same hours. The castle can only be visited by groups during a guided tour. 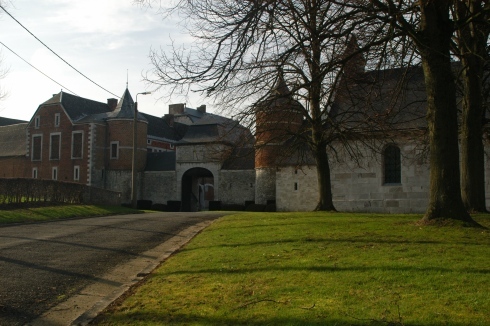 95 Corroy-le-ChÃ¢teau castle in Gembloux. Based on a 13th century stronghold. The castle can be visited from May - September on Sundays and public holidays from 10 AM - Noon and from 2 PM - 6 PM. In July and August also on Saturdays. 96 Seneffe castle in Seneffe. This 18th century castle is situated in the center of remarkable buildings as there are an orangery, a neoclassic theater, an aviary and gardens in a 22 ha (60 acres) park. 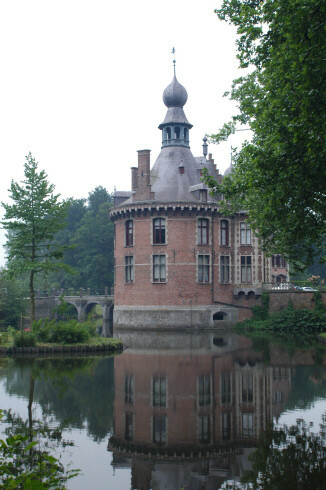 The castle is the Silversmiths' Museum of the French Community in Belgium. Open all year from Tuesday - Sunday from 10 AM - 6 PM. Park and gardens open all year from 8 AM - 6 PM. From April - September till 8 PM. There is a cafeteria on the domain. 97 Le Roeulx castle in Le Roeulx. 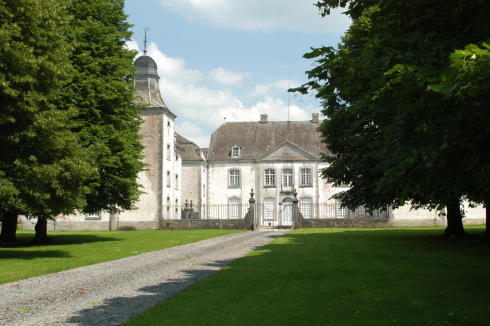 This 18th century castle is one of the most important of Belgium. It is situated in a 45 ha (123 acres) big park. The castle can only be visited during rare activities and exhibitions. 98 Avouerie in Anthisnes. 17th century castle with a 12th century donjon and a 16th century church. Open all year every day from 10 AM - 6 PM. 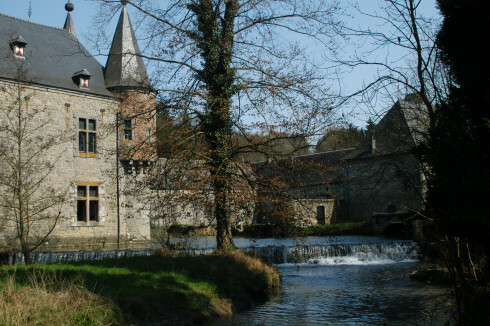 Anthisnes is one of the most beautiful villages of Wallonia. 99 Reinhardstein castle in Waimes. Founded in the 14th century. In the early 20th century only ruines were left. From 1969 on it has been fully restored and is now a real beauty. The splendid main hall is decorated with wall tapesteries and many 15th century objects. Open for guided visits from June 15 - September 15 on Sundays at 2.15 PM and 5.15 PM. In July and August also on Tuesdays, Thursdays and Saturdays at 3.30 PM. 100 Citadel in Namur. One of the most important fortresses of Europe. In 1815 rebuilt from its ruines. 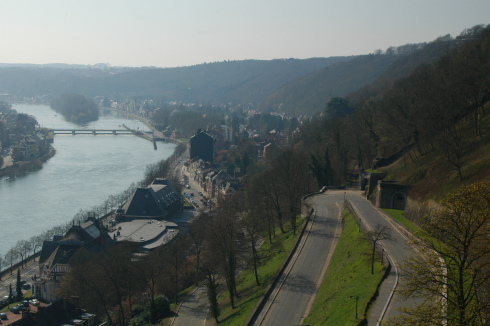 From the Citadel you have a breathtaking view over the city and the confluence of the Meuse and Sambre rivers. Open during the Easter holidays and from June till the end of October daily from 11 AM - 5 PM. From the end of the Easter holidays till the end of May during the weekends and public holidays, same hours. 101 HarzÃ© castle in Aywaille. Founded in the 12th century and renovated from the 15th - 18th century. In outhouses of the castle are situated the Provincial Museum of the water mill with fully functioning mill and the Backery museum. Open during Easter holidays and July and August daily from 11 AM - 6 PM. In may, June, September and October during the weekends and public holidays from 1 PM - 6 PM. 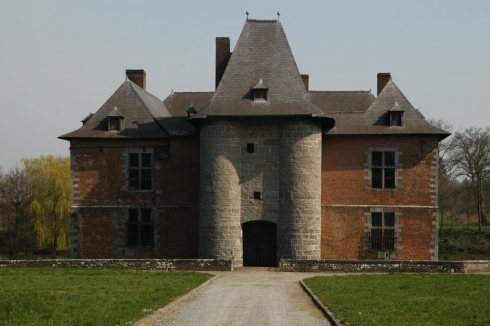 102 Trazegnies castle in Courcelles. Built on the ruines of an 11th century castle and situated in a very nice park. Inside is a themed museum "The tools of our ancestors". Open from Mai 1 - September 30 during the weekends and on public holidays from 2.30 PM - 5.30 PM. Guided visit at 3 PM. 103 Modave castle in Modave. This 17th century castle is one of the most beautiful and impressive ones of Belgium. It was built according the style of the French castles in that period. The 450 ha (1230 acres) domain around the castle is a Nature Reserve. Open from April 1 - November 15 and from December 25 - January 1 from Tuesday - Sunday from 10 AM - 6 PM. 104 Bivort castle in Fontaine-L'Eveque. A 13th century feudal castle, which nowadays houses municipal services. Two halls, the rose and the blue room, can be visited. 106 Petite Somme castle in Septon. Splendid castle, owned and inhabited by the spiritual community "Radhadesh". We did not visit the interior, but we met several nice and gentle members in the square. We also noted that many busses with school children halted at the castle. Anyway the members of the community seem very pleased to show their castle to visitors. 107 Crupet castle in Assesse. Originally from the 13th century, but importantly renovated in the 16th century. This robust castle lies in an islet and can only be reached over the tree-arc bridge. Can be visited from May - September after arrangement. 108 Acoz castle in Acoz. This 12th century castle is set in the heart of the Biesme valley, in grounds with gardens, ponds, meadows, woods and hills. It consists of two wings to the S. and E. and a tower to the NE. It used to be a huge fortified quadrilateral structure. In the 12th c., the Acoz estate was a dependency of Floreffe Abbey. In 2001, Tony Cammaert, antiquarian from the Grand Sablon in Brussels and specialised in Japanese art, acquired the castle. Since then he has been restoring the entire castle and the estate with great care. 109 Spontin castle in Yvoir. This 13th century castle is one of the most beautiful castles of Belgium. Unfortunately the interior can not be visited anymore. But the outside is so beautiful that it justifies a detour (see our photo). 110 Ham-sur-Heure castle in Ham-sur-Heure. This originally 13th century castle lies in a splendid park that can be freely accessed. Nowadays the castle houses the Town Hall and a museum. Only the park and the museum can be visited. 111 Deulin castle in Hotton. Built in 1760 and still owned by the Harlez family. In the castle park, layed out around a romantic big pond, there is a 7 ha (19 acres) special arboretum. Can only be visited by groups after arrangement. 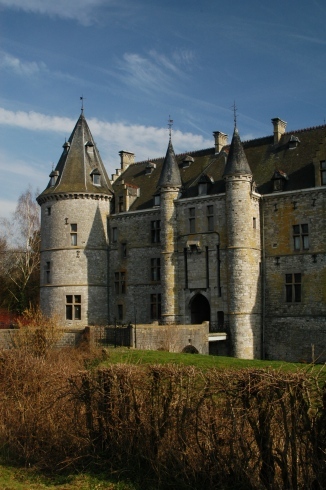 112 Fosteau castle in Thuin. Impressive 14th century castle which houses one of the most beautiful gothic halls in Belgium. The castle has 7 towers and the actual building date from the 14th - 19th century. The whole year there is an exposition and sale of antiques, Fine Art objects and Persian tapestries. Open all year from Thursday - Monday from 2 PM - 7 PM and by appointment. 113 FalaÃ«n castle-farm in Onhaye. Castle-farm from the late 17th century. It houses the museum of the Gastronomic Brotherhoods and can be visited from March 1 - November 30 on Sundays from 1 PM - 8 PM. From April 1 - September 30 also on Saturdays and in July and August daily, same hours. 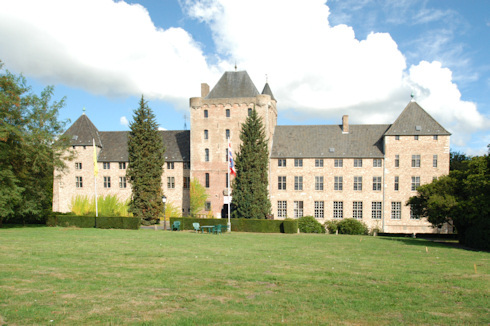 114 Thy-le-ChÃ¢teau castle in Thy-le-ChÃ¢teau. Reception rooms in the medieval castle located in the center of the village of Thy-Le-ChÃ¢teau are the new destination. Several rooms with capacities of 100 - 300 visitors are available. 115 Citadel in Dinant. Built by the Dutch in 1818 - 1821 100 m above the Meuse river, which guarantees splendid views. The citadel houses a Museum of Weaponry. Open all year, exept in January from 10 AM - 6 PM. 117 ValÃ©ry Cousin Provincial Domain in Ciney. A real family domain of 500 ha (1370 acres) with a castle, an Olympic swimming pool, fishing ponds, an arboretum, barbecue spots and wooden houses. Possibilities for many different sports. Many different lodging formulae are offered: family chalets, a motel, wooden houses for groups of 20 - 33 persons, cottages, a camping and caravans. Open from Easter till the end of September and the whole year for accommodation, sports and indoor activities. 118 VÃªves castle in Houyet. Very nice castle from the 15th century. The interior contains very impressive furniture. Open from April - October from Tuesday - Sunday from 10 AM - 6 PM. In July and August daily. In April and October till 5 PM. 119 Ruines in La Roche-en-Ardenne. Impressive ruins of a 9th century castle. 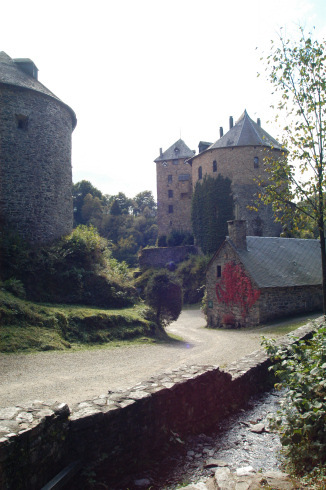 From the ruins you have a splendid view over the town and the valley of the Ourthe river. Open: In July and August daily from 10 AM - 7 PM. In April, Mai, June, September and October daily from 10 AM - Noon and from 2 PM - 5 PM. In November - March on weekdays from 1.30 PM - 4.30 PM and during weekends from 10 AM - Noon and from 1.30 PM - 4.30 PM. 120 Lavaux castle in Lavaux-Sainte-Anne. Founded in the 13th century, competed in the 17th century and renovated in 2004. Very impressive castle with farm. Houses museums and rooms for exhibitions. In the cafeteria you will be prepared for your visit by means of projections and large photos. There is also a business room with Internet connections. There is also a nice terrace in the gardens. Open from Tuesday - Sunday from 9 AM - 6 PM. In July and August till 7 PM. 121 Chimay castle in Chimay. Founded in 1600 this castle is situated in a 150 ha (410 acres) walled park! Only guided visits. From Easter - end of September at 10 AM, 11 AM, 3 PM and 4 PM. Rest of the year only by appointment. 122 Bouillon stronghold in Bouillon. Built in 1082 by Godfroid de Bouillon this stronghold is the most important witness of the military architecture of the Middle Ages in Belgium. From the "Austria" tower you have a splendid view over the whole complex, but also over Bouillon. Open all year from 10 AM - 5 PM or 6.30 PM. In July and August visits at night are possible. 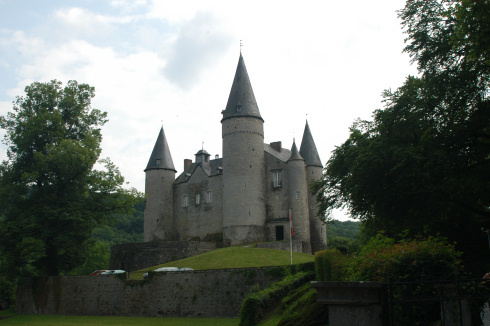 Return from "Belgian Castles" to the Home page.